You’ve probably heard a lot about how junk food negatively affects your body. You’ve probably also heard about all of the studies carried out on fast food and the ingredients, chemicals and additives it contains. Nevertheless, when your stomach starts to rumble and you are dying for a quick bite, a Big Mac just seems too tempting to resist. And, once you sink your teeth into it, all the studies with their cautionary facts and figures are quickly forgotten in the rush of consuming a nice, juicy Big Mac. But, maybe you need to take a better look at this appetizing burger. Below, we have summarized the ingredients of the Big Mac and their effects on your body. You’ll notice that it can be a challenge to choose a healthy meal. Let’s take a look at what the Big Mac does to your body. 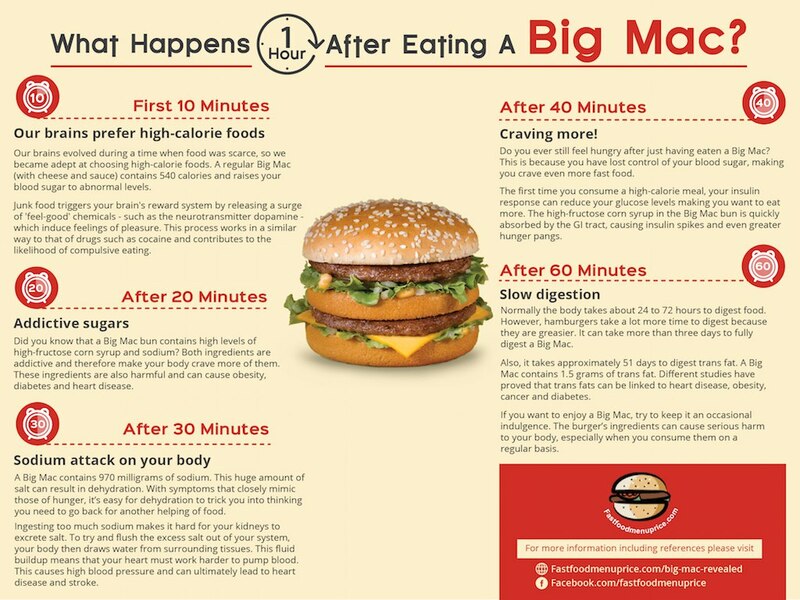 What Happens in the Hour After You Eat a Big Mac? Our brains evolved during a time when food was scarce, so we became adept at choosing high-calorie foods. A regular Big Mac (with cheese and sauce) contains 540 calories and raises your blood sugar to abnormal levels. Junk food triggers your brain’s reward system by releasing a surge of ‘feel-good’ chemicals – such as the neurotransmitter dopamine – which induce feelings of pleasure. This process works in a similar way to that of drugs such as cocaine and contributes to the likelihood of compulsive eating. Did you know that a Big Mac bun contains high levels of high-fructose corn syrup and sodium? Both ingredients are addictive and therefore make your body crave more of them. These ingredients are also harmful and can cause obesity, diabetes and heart disease. A Big Mac contains 970 milligrams of sodium. This huge amount of salt can result in dehydration. With symptoms that closely mimic those of hunger, it’s easy for dehydration to trick you into thinking you need to go back for another helping of food. Ingesting too much sodium makes it hard for your kidneys to excrete salt. To try and flush the excess salt out of your system, your body then draws water from surrounding tissues. This fluid buildup means that your heart must work harder to pump blood. This causes high blood pressure and can ultimately lead to heart disease and stroke. After 40 minutes –Craving more! Do you ever still feel hungry after just having eaten a Big Mac? This is because you have lost control of your blood sugar, making you crave even more fast food. The first time you consume a high-calorie meal, your insulin response can reduce your glucose levels making you want to eat more. The high-fructose corn syrup in the Big Mac bun is quickly absorbed by the GI tract, causing insulin spikes and even greater hunger pangs. Normally the body takes about 24 to 72 hours to digest food. However, hamburgers take a lot more time to digest because they are greasier. It can take more than three days to fully digest a Big Mac. Also, it takes approximately 51 days to digest trans fat. A Big Mac contains 1.5 grams of trans fat. Different studies have proved that trans fats can be linked to heart disease, obesity, cancer and diabetes. If you want to enjoy a Big Mac, try to keep it an occasional indulgence. The burger’s ingredients can cause serious harm to your body, especially when you consume them on a regular basis. Now, let’s take a close look at the ingredients of a Big Mac as listed on the McDonald’s website and how they match up with the infographic. Note: these are the ingredients for Big Macs produced in the US. Ingredients: Enriched Bleached Flour (Wheat Flour, Malted Barley Flour, Niacin, Reduced Iron, Thiamin Mononitrate, Riboflavin, Folic Acid), Water, High Fructose Corn Syrup, Yeast, Soybean Oil, Contains 2% or Less: Salt, Wheat Gluten, Sesame Seeds, Leavening (Calcium Sulfate, Ammonium Sulfate), May Contain One or More Dough Conditioners (Sodium Stearoyl Lactylate, DATEM, Ascorbic Acid, Azodicarbonamide, Mono and Diglycerides, Monocalcium Phosphate, Enzymes, Calcium Peroxide), Calcium Propionate (Preservative). CONTAINS: WHEAT. Okay, so, how much damage can that do? After all, isn’t the Big Mac bun just flour, yeast, salt and water? True, but it also contains high-fructose corn syrup, sugar, wheat and soy lecithin. Do you ever wonder why you have cravings for a Big Mac? That’s because all these additives act as taste enhancers and make you crave more. They also enhance the risk of heart disease and diabetes. Moreover, in addition to the generous sprinkling of sesame seeds, you also have azodicarbonamide. Still struggling to get the pronunciation right? Azodicarbonamide is the agent that bleaches the bun to give it that attractive white color. Unfortunately, it is also carcinogenic (cancer-causing). And there’s more: the big bun is made of white flour that has been shelled and the healthy bran removed. This bran contributes to the full feeling you get after eating. Without it, as soon as you finish your Big Mac you will feel hungry again. Also, without the fiber provided by the bran your insulin levels will be triggered to rise to abnormal levels. Moreover, eating white flour regularly over a period of five years increases your chances of becoming overweight by 40%. Still wondering why there are so many overweight people in the States? Ingredients: Milk, Cream, Water, Cheese Culture, Sodium Citrate, Contains 2% or Less of: Salt, Citric Acid, Sodium Phosphate, Sorbic Acid (Preservative), Lactic Acid, Acetic Acid, Enzymes, Sodium Pyrophosphate, Natural Flavor (Dairy Source), Color Added, Soy Lecithin (Added for Slice Separation). CONTAINS: MILK AND SOY LECITHIN. Now, that’s just a dairy product right? The whole world eats cheese, so why is it on the list of scary ingredients? Check its composition and you’ll see a list of chemicals that don’t look like they come from a cow. You’ll see salt or sodium, preservatives, added coloring and soy lecithin, which prevents the cheese slices from sticking to one another. The slices also have a particularly suspicious additive, ‘natural flavor from dairy source.’ Now, why would anyone want to add dairy flavor to cheese? This one has to be safe. The company specifies that its patties are 100% pure meat and do not contain any fillers or extenders. McDonald’s also has the USDA inspect the beef it uses. The difficulty? To get that nice, juicy burger on your Big Mac it needs to be processed and transformed, which most probably means that chemicals have been added. We all recall the pictures of the McDonald’s hamburgers after a few years: they still look perfectly edible. Let’s also not forget the sodium the patties contain: this can do damage to your heart. Ingredients: Soybean Oil, Pickle Relish (Diced Pickles, High Fructose Corn Syrup, Sugar, Vinegar, Corn Syrup, Salt, Calcium Chloride, Xanthan Gum, Potassium Sorbate [Preservative], Spice Extractives, Polysorbate 80), Distilled Vinegar, Water, Egg Yolks, High Fructose Corn Syrup, Onion Powder, Mustard Seed, Salt, Spices, Propylene Glycol Alginate, Sodium Benzoate (Preservative), Mustard Bran, Sugar, Garlic Powder, Vegetable Protein (Hydrolyzed Corn, Soy and Wheat), Caramel Color, Extractives of Paprika, Soy Lecithin, Turmeric (Color), Calcium Disodium EDTA (Protect Flavor). CONTAINS: WHEAT, EGG AND SOY. The Big Mac wouldn’t be a Big Mac without the sauce, now would it? The issue is that the list of 33 ingredients that go into the sauce aren’t exactly appetizing. In addition to the high-fructose corn syrup, sodium, preservatives and other ingredients, you have a special additive: propylene glycol. Nope, that’s not a fancy name for a spice. You’ll find it in shampoo and engine coolants and it’s even used as antifreeze. Ingredients: Cucumbers, Water, Distilled Vinegar, Salt, Calcium Chloride, Alum, Potassium Sorbate (Preservative), Natural Flavors (Plant Source), Polysorbate 80, Extractives of Turmeric (Color). That’s just cucumbers in vinegar. Why are they a problem? They’re processed, and contain salt. The Big Mac must have some saving grace. It does, in the form of the shredded lettuce and onions. Unfortunately, the amount of lettuce and onions on the Big Mac is too little to compensate for the damage the other stuff can do to your body. Now that you better understand what the visible stuff can do to you, let’s see what the invisible additions to a Big Mac can do to your body. Calories can be scary to think about. When you think about them in the context of a Big Mac, they’re terrifying. For instance, if you allow yourself 2,000 calories a day – the maximum number of calories the average woman needs per day – a Big Mac will absorb more than a quarter of your daily calorie allowance. That’s right. This sandwich has 540 calories all by itself. That’s 38% of the maximum number of calories a woman should ingest in a day. Have you ever seen someone eating a ‘naked’ Big Mac? Nope, neither have I. You’ll also want something to wash it down with, so you order a large, chilled Coke and that sets you back another 260 calories. If you absolutely must have a side order (and of course you must! ), those large fries are going to cost you another 500 calories. Count everything up and you have 1,330 calories. That’s a big slice of the 2,000 calories a woman should consume in a single day. If you’re on a diet, or simply don’t compensate for this meal later in the day, you’ll have a ‘Big’ problem on your hands, and waistline. On a 2,000-calorie-a-day diet, you should limit yourself to 60 grams of fat. Of this, 20 grams, at the most, should be saturated fat. Now, let’s take a look at our favorite hamburger: the Big Mac contains 29 grams of fat of which 10 grams is saturated fat. That’s about half the saturated fat you’re allowed in a day! The sandwich also contains 1.5 grams of trans fat. Besides worrying about weight gain, you also need to consider the effects trans fat has on your cholesterol and risk of heart disease. The Harvard School of Public Health states that trans fat raises your bad cholesterol levels and argues that it should be eliminated completely from your diet. Apparently, trans fat causes your gut to swell and hampers your body’s ability to produce neurotransmitters such as dopamine and serotonin. These chemicals are what make you feel full after the meal. Without these essential biological chemicals, you’ll be dying for even more food sometime very soon..
Want to get started on those delicious large fries you ordered on the side? Probably not, because they contain 25 grams of fat, including 2.5 grams of saturated fat. A Big Mac contains lots of sodium. Sodium does not make you gain weight, but it makes your cells retain water, and that’s what makes you feel bloated. You can safely ingest 2,300 milligrams of sodium in a day, but eat a Big Mac and you’ll be consuming 970 milligrams or 42% of your daily sodium allowance. And, if you’ve been advised to consume a low-sodium diet, you’ll be eating 88% of the sodium you can have in a day. Have you noticed that we haven’t mentioned the fries yet? Ingesting excessive sodium makes your heart work extra hard and that can raise your blood pressure as well as your chances of having heart trouble and a stroke. Your kidneys also have to work harder to process all this excess sodium. As a result, very soon after eating a Big Mac you start to feel dehydrated and really thirsty. The problem is that the body often mistakes thirst for hunger, so you might think you’re hungry again. And, when you’re looking for a quick energy-booster, your brain is going to direct you to the desserts. So, now you know why you crave that ice cream after your burger. Many people are under the impression that if they eliminate the Coke from their meal this should help them to slash their sugar intake. Well, that doesn’t really work. True, your Big Mac has only 9 grams of sugar in it, but – as you’ve already noticed from the infographic – it also contains high-fructose corn syrup. Moreover, there’s sugar in the sauce and the other condiments too. Here’s how your digestion works. The food you eat is converted into glucose, a form of sugar. As soon as your pancreas senses the glucose in your blood, it releases a hormone, insulin. Insulin converts glucose into energy and transfers some of it to your cells so they can function. The rest is stored for use later. When your calorie intake exceeds your energy output, the glucose is stored as fat. Unfortunately for you, there is practically no limit on how many calories your body can store as fat. Ingesting too many calories over a prolonged period of time increases your risk of diabetes.